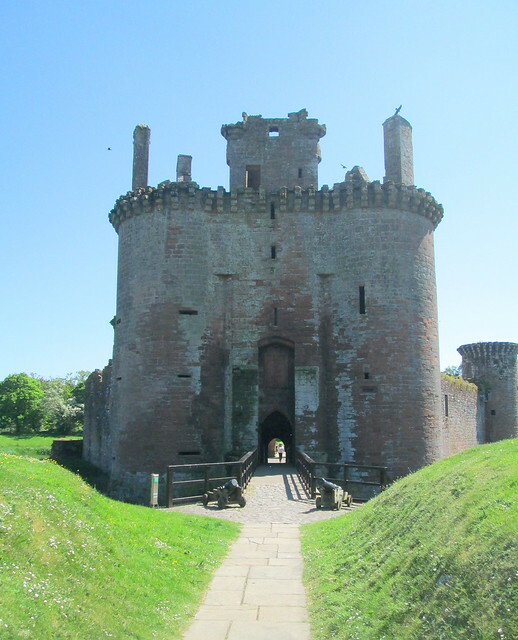 We visited Caerlaverock Castle when we were in Dumfries and Galloway in May. 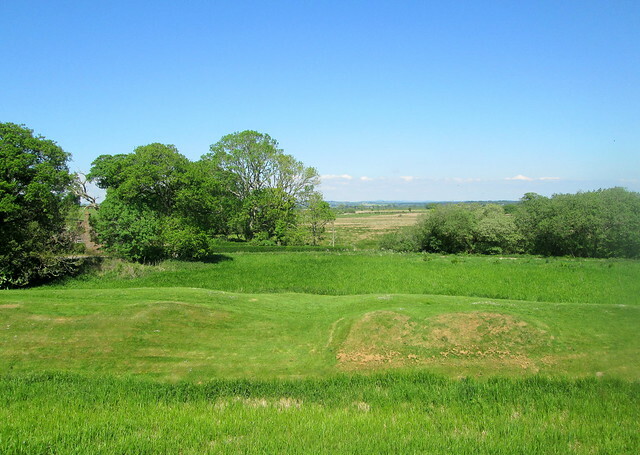 It’s a great castle ruin with a very unusual shape, triangular which I suppose is a good shape for defensive reasons. It also has a proper moat. I know that if I had lived in a castle in those days I would have wanted a moat so that I didn’t have to worry about people scaling the walls during the night. 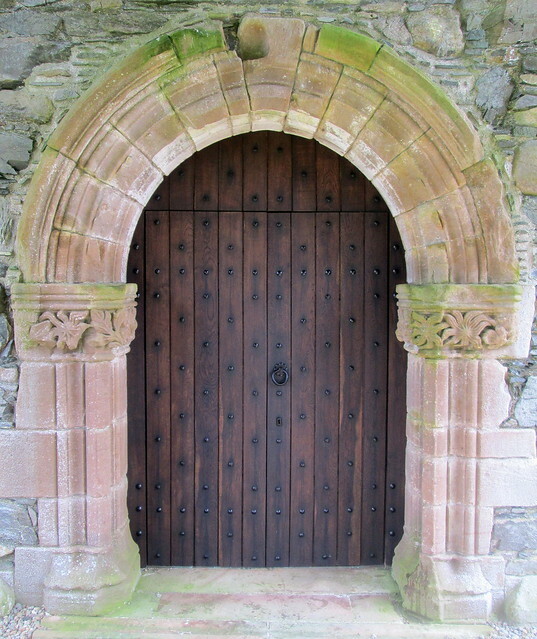 If your drawbridge was up – it was safe to go to sleep! 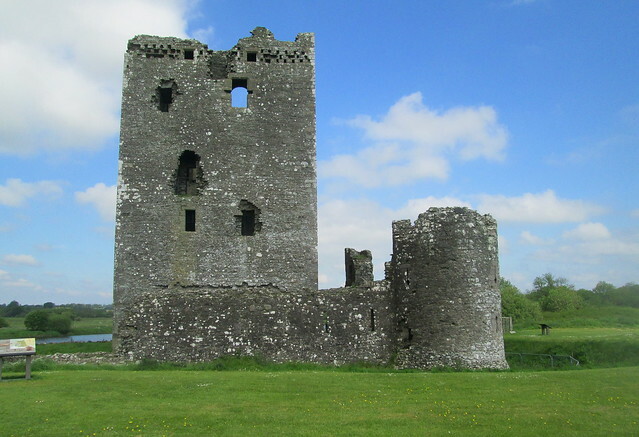 Building work started on this castle in the 1260s and it was finished in the 1270s, but this is the ‘new’ castle as the old one just 200 yards away was abandoned because it began to sink. 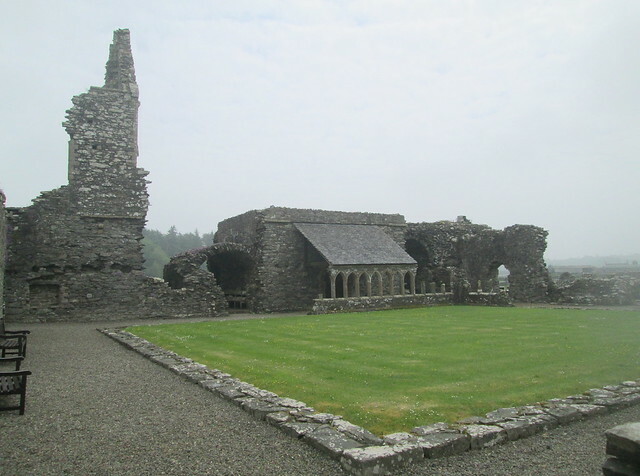 It was built in 1220 and if you go you should make time to visit what is left of it, just the foundations really, but it’s still interesting. 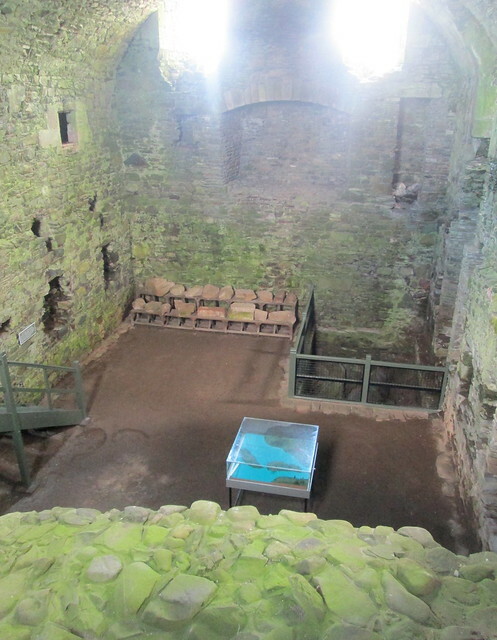 Below is a photo of part of the castle from the inside. 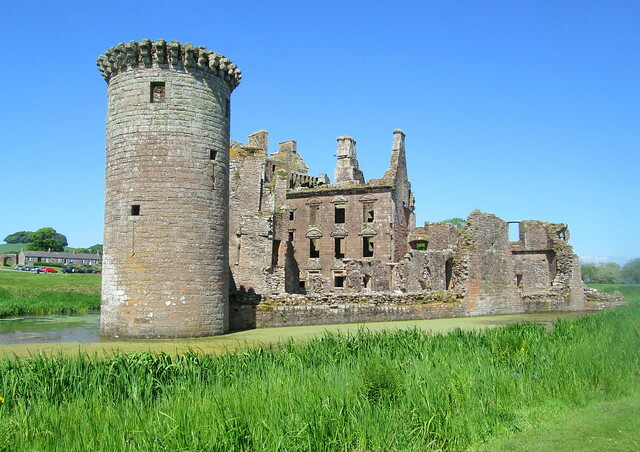 As Caerlaverock is so close to the border with England it was often attacked and besieged. 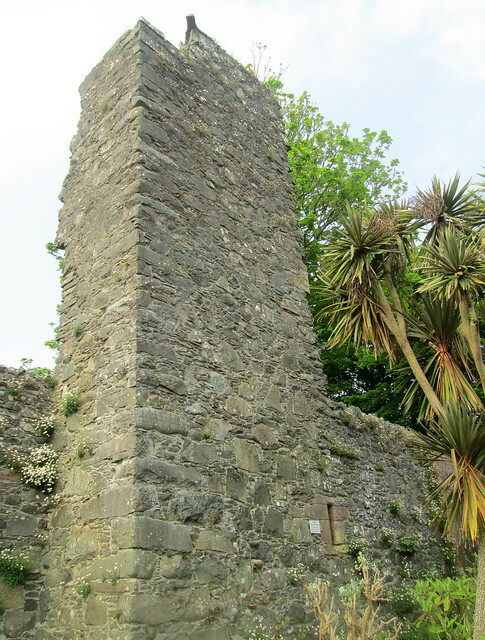 With the English king Edward 1 (Hammer of the Scots) attacking the castle in 1300 with over 3,000 men and using siege engines serious damage must have been done to the walls at that time. 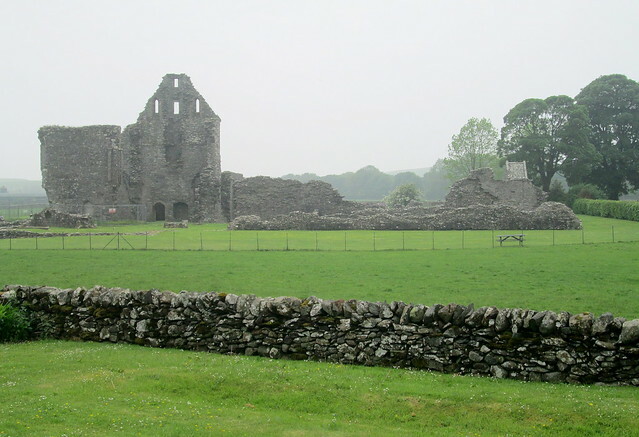 The castle changed hand many times over the years between Scotland and England. 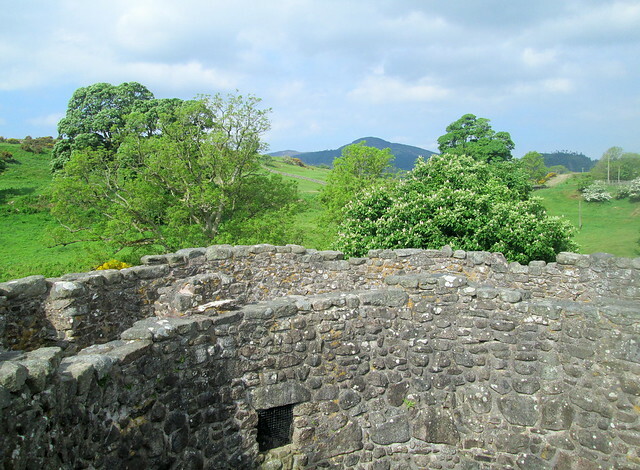 Most of the castle that can be seen today dates from the 1300s and 1400s. 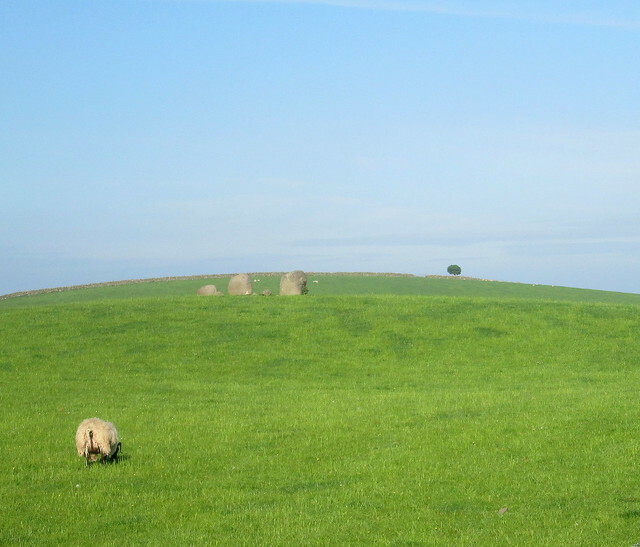 The countryside around that area is quite pretty, in the photo below you can see that there must have been buildings where there is now grass. That will be even more obvious now that we’ve had such a long spell of hot dry weather. I think this is one of my favourite ruined castles. Just imagine how atmospheric it would as darkness falls on a moonlit night, or even in the gloaming (twilight). 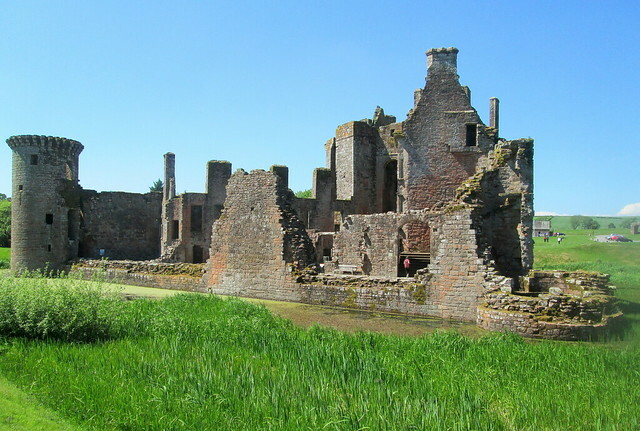 You cam see more images of Caerlaverock Castle here. 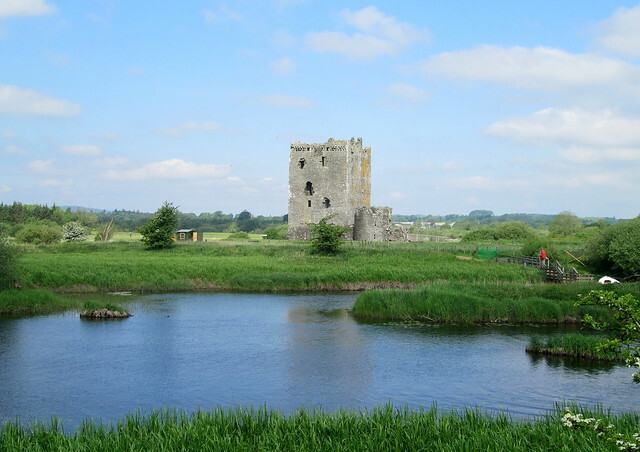 On the second day of our recent four night trip to Dumfries and Galloway in south west Scotland the first historical place we visited was Threave Castle. Visiting this castle is a bit more awkward than some others as you have to get in a boat to get there, although it’s such a short stretch of water that it takes about three minutes to get there. Despite the fact that the water is so shallow that if you fell in it would only come up to your knees – they still make you put on a lifejacket! The castle sits on an island in the middle of the River Dee and it’s only the second castle that I’ve had to get on a boat to visit, the other one being Loch Leven Castle. It’s a big improvement on a moat though, I imagine the inhabitants would have felt nice and safe. 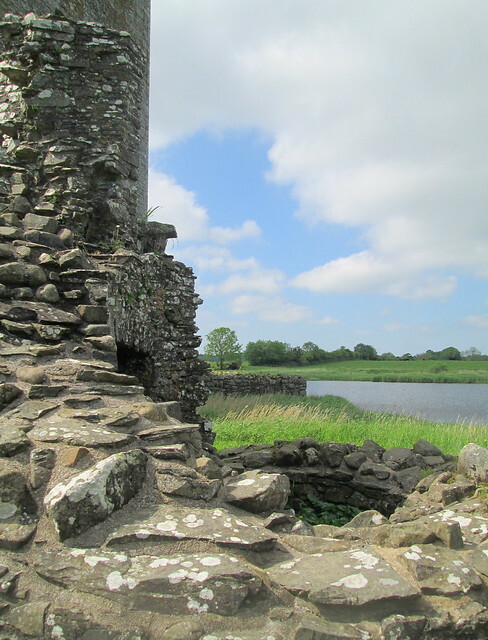 But Threave Castle did come under attack when the Douglas family it belonged to fell foul of King James II in 1455 and the windows below look onto the area where he had huge guns positioned to fire at the castle over the river. The king had decided that that branch of the Douglas family was going to be wiped out. 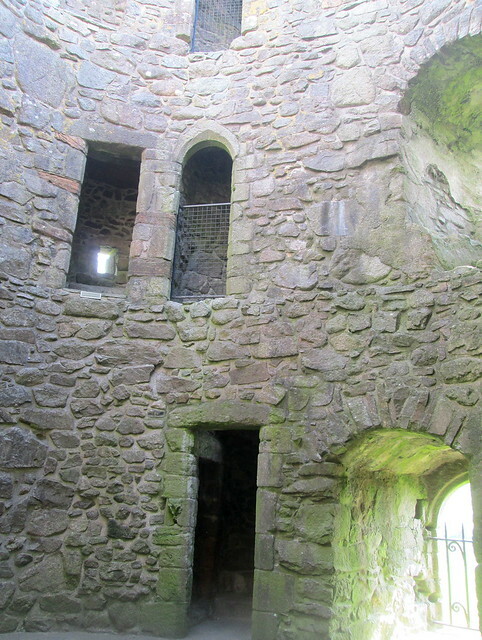 The arrows fired through the arrow slit windows below wouldn’t have been much use against cannonballs. Inside is really just one big room now. There’s an RSPB bird sanctuary nearby and after leaving the island we went for a circular walk and had a look for wildlife from one of the hides. In the distance the ospreys were flying around, also red kites and buzzards. In fact it looked like the red kites were being a bit too successful as there were loads of them flying around. 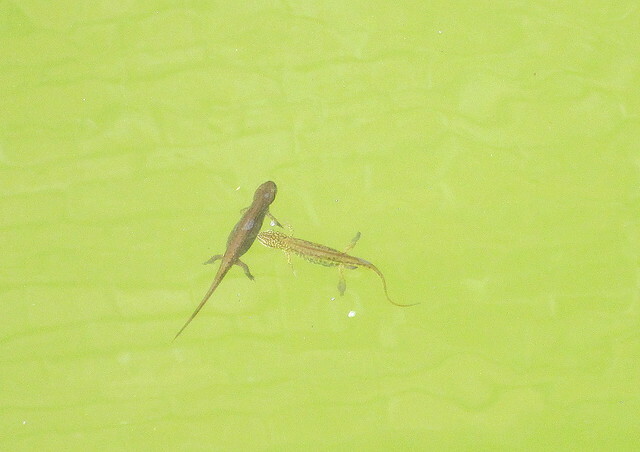 But I’ll leave them for another blogpost. 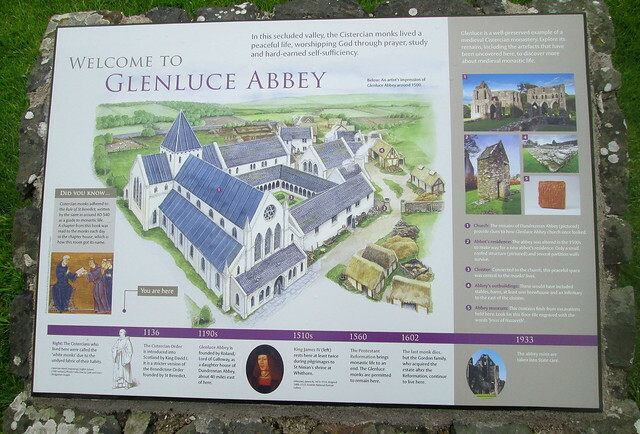 One of the many historical places we visited when we were in south west Scotland in Dumfries and Galloway recently was Glenluce Abbey – yes, yet another ruin! 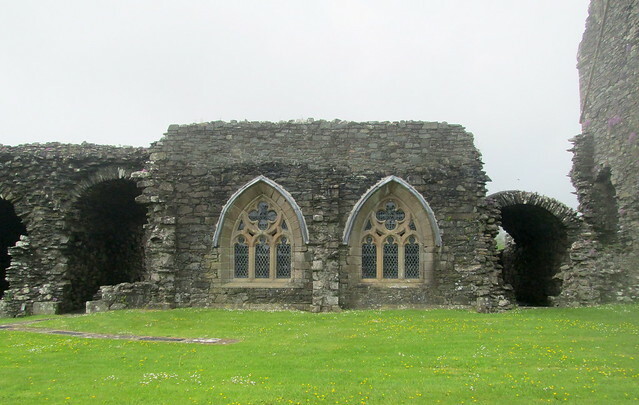 It was founded around 1192 it’s thought, and was a daughter abbey to Dundrennan Abbey, so it was a Cistercian abbey peopled by monks who wore white robes. 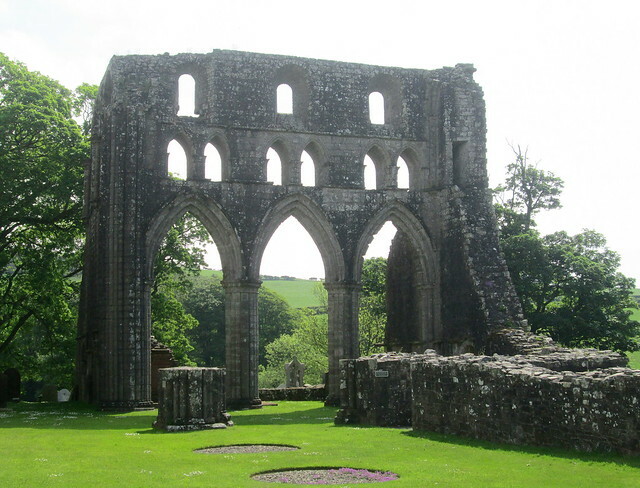 After the Reformation in 1560 the monks embraced the new religion and were allowed to live out their lives in the abbey with the last one dying in 1602. Like most of these places when they were no longer used the people living locally used the place as a handy quarry, an easy place to go and purloin some nice stone for whatever domestic project they had on hand. 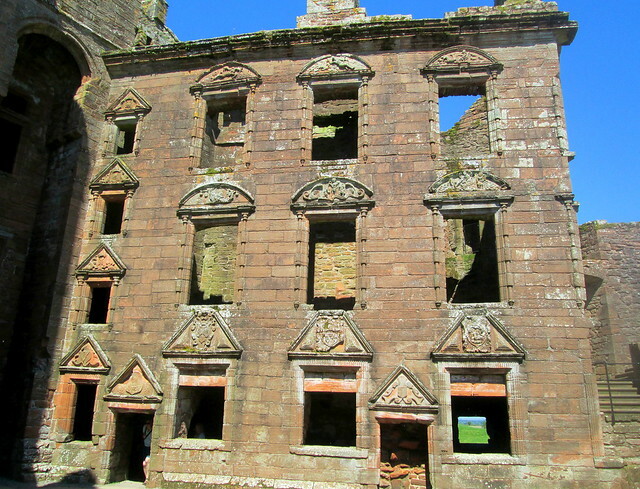 The windows in the photo below have obviously been fairly recently restored. 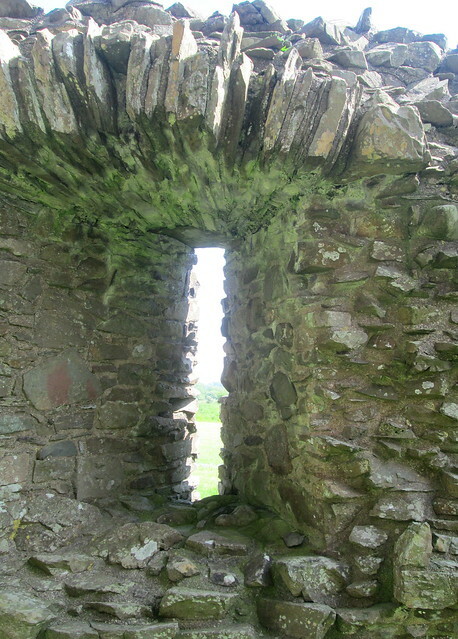 Quite often you can see quite fancy stones in the walls of local cottages near such ruins which were clearly taken from a much more important building. 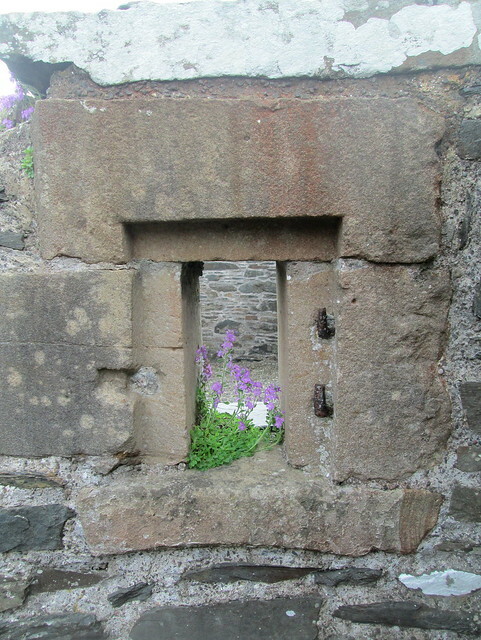 There’s a very sweet and dainty looking type of wee fern-like plant, but it has lilac flowers, which has very happily set up home in lots of the abbey stonework. The one below has settled in what must have been a small shuttered window, but the shutter is long gone. 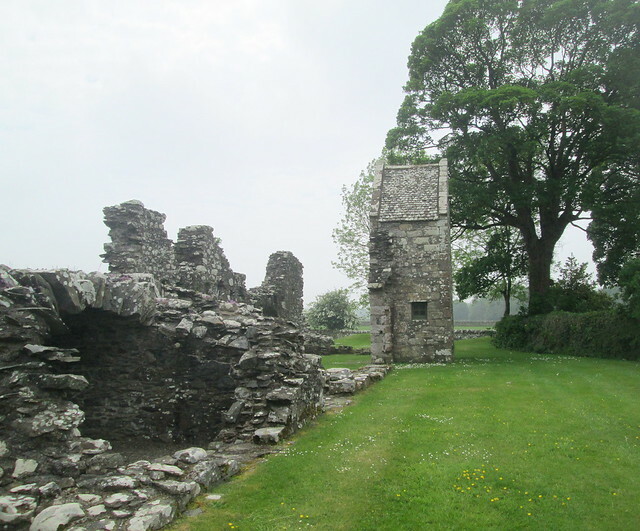 And below is a very narrow but tall building which was for the use of the abbot. Inside it’s just one teeny wee room, about five feet wide I think. There must have been two or three storeys to it originally but the floors have gone and the abbott must have used a ladder to get up there as there’s no room for any stairs. The height and narrowness of it makes it look very French to me. Sadly it wasn’t possible to get a photo of the front of that building because of the overhanging trees. 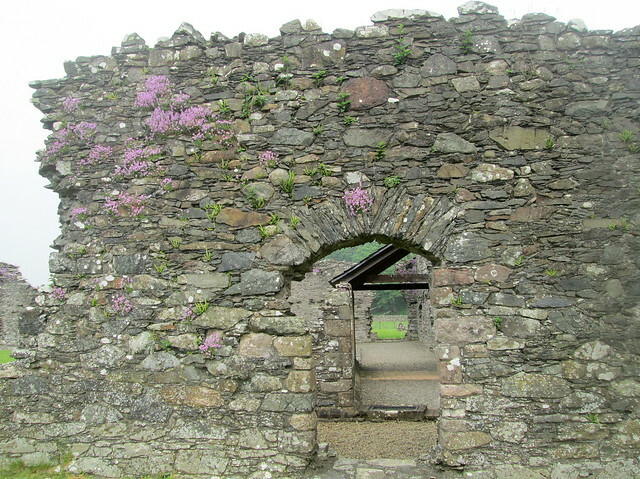 It looks perfect to me, it would make a wonderful folly if you were lucky enough to have a big enough garden for it! 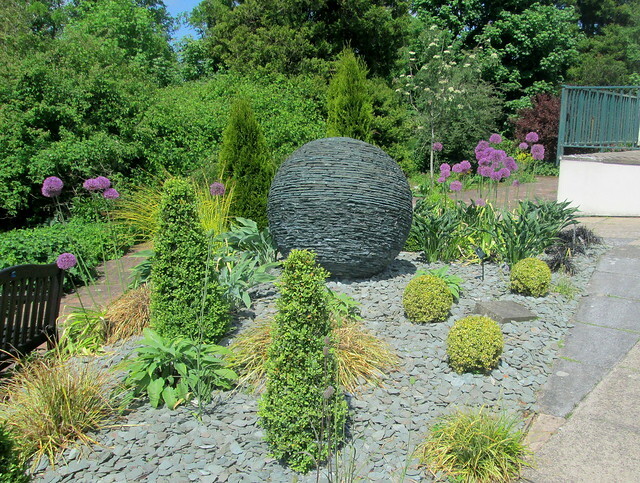 Back to Threave Gardens again and the photo below is close to the entrance, it looks like a newly planted area and the sphere is made up of slate, very trendy at the moment I think. I’m sure they’re also very expensive as there’s obviously a lot of skill and time involved in sculpting something like that. 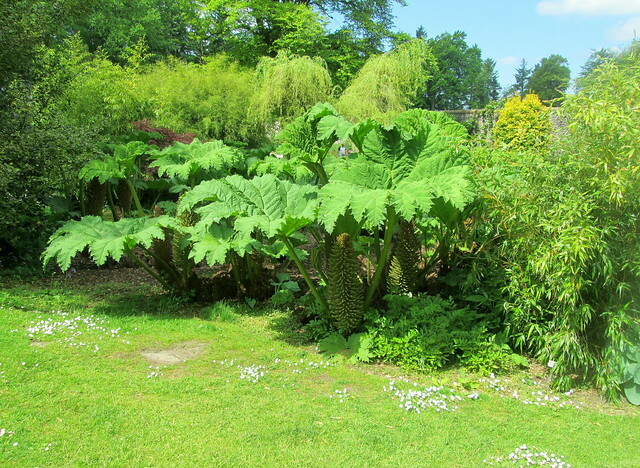 Giant Gunneras seem to grow well in Scotland, there are quite a lot growing in the Edinburgh Botanical Gardens too. 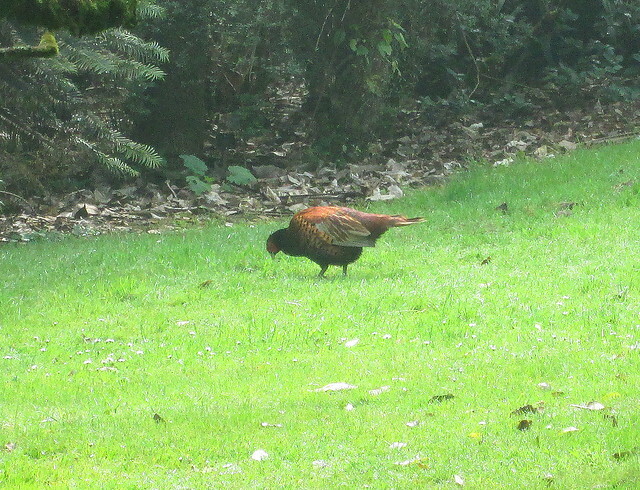 They always remind me of a Beatrix Potter illustration. 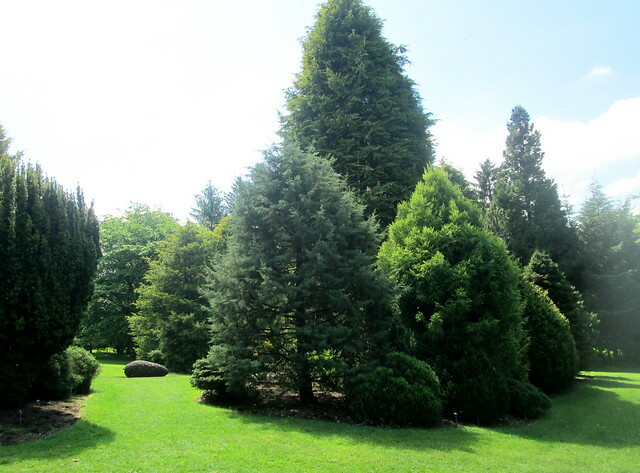 There are some really lovely trees growing at Threave and in the distance below there’s a large carved wooden fir cone. 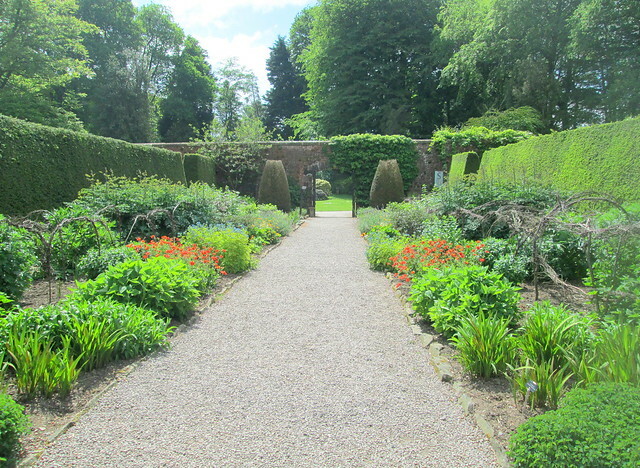 I love walled gardens, they always have a feeling of safety and comfort and of course the walls offer great protection for the plants, the one at Threave is beautiful. 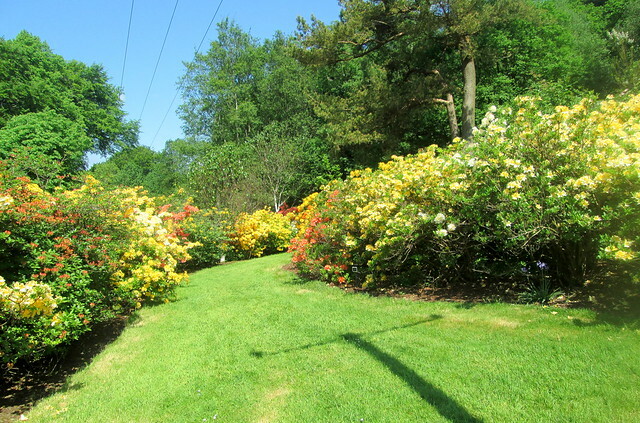 Threave really has a wonderful variety of plants and different types of gardens. 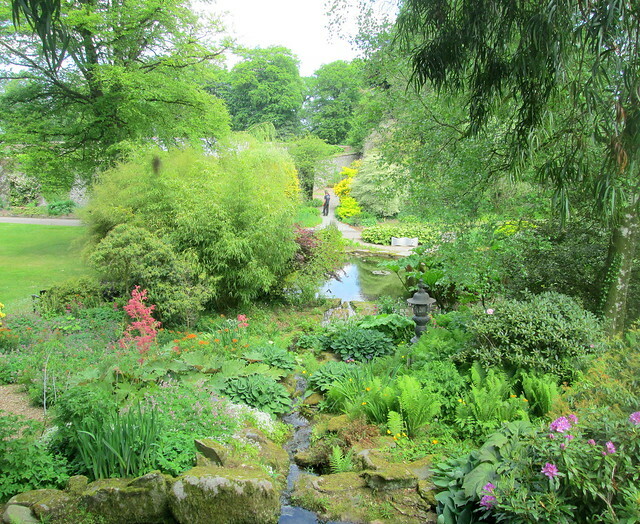 I was quite surprised by the rockery below though as it doesn’t have much in the way of rocks. I thought my rockery was a bit lacking in rocks but it has more than this one at Threave. Below is another sculpture which is a big lump of rock with carvings of animals on it. I prefer big rocks to be left au naturel as to me you can never improve on the beauty of a natural rock face, but that’s just my opinion. The trees look fantastic though – don’t they? 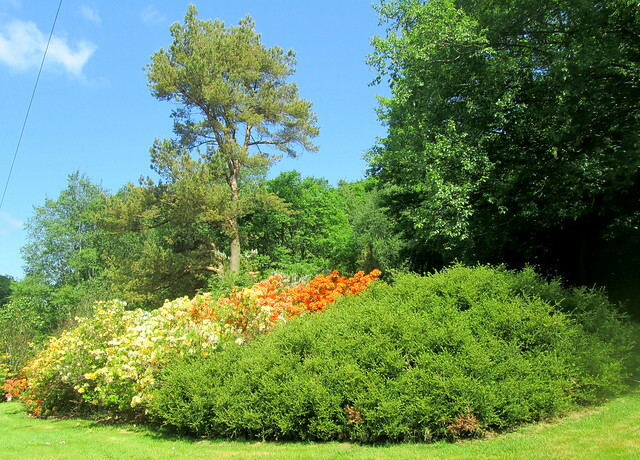 We visited Threave Gardens during our recent four day trip to Dumfries and Galloway and we got there at the perfect time, just as the rhododendrons and azaleas were looking their best. 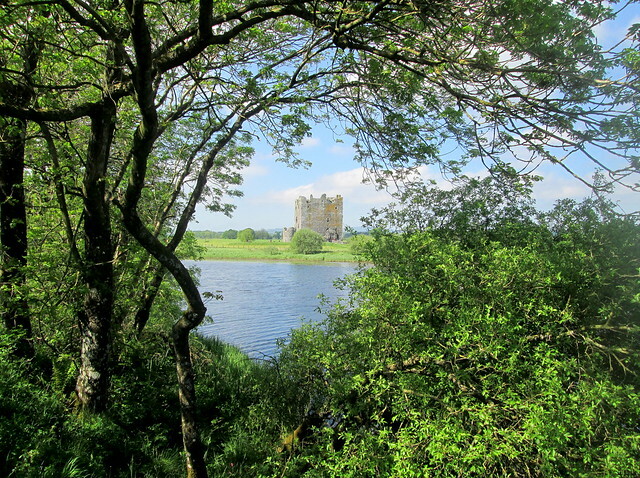 The nearest town to Threave is Castle Douglas. It’s very weird but when I was there I didn’t even notice the electricity wires in this photo, or the shadow, too busy looking at the plants I suppose. This was originally a private estate but I believe it is now used as a horticultural training centre and the students have accommodation in what was the estate house – very nice I’m sure. 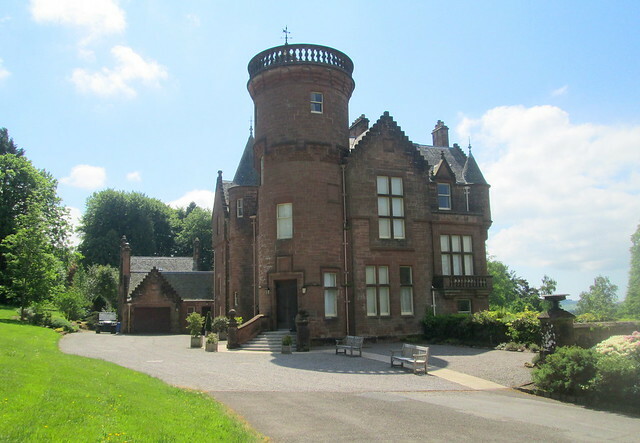 The house is of course in the Scots Baronial style. 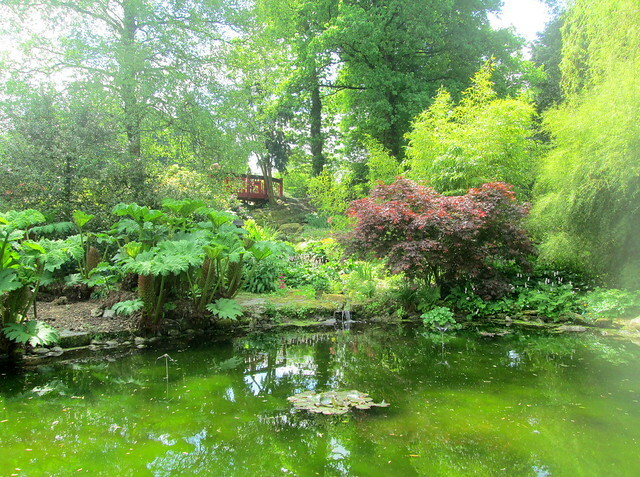 There’s a wee burn running through the gardens in the Japanese section. 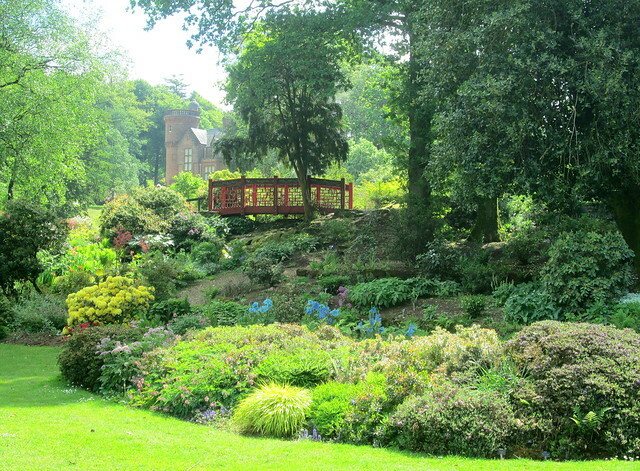 It wouldn’t be a Japanese Garden without a bridge and acers of course. 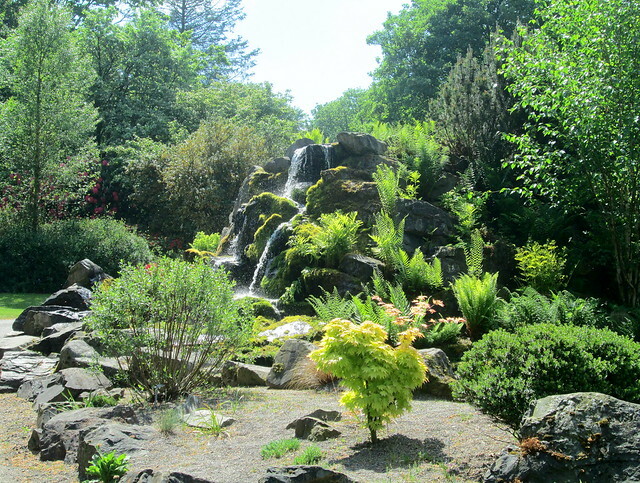 And a wee bit of a waterfall too. 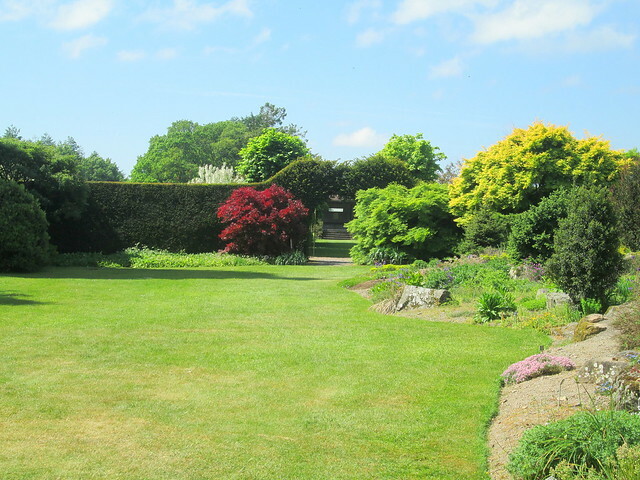 It was a boiling hot and very bright day, in fact too bright – not that I’m moaning. 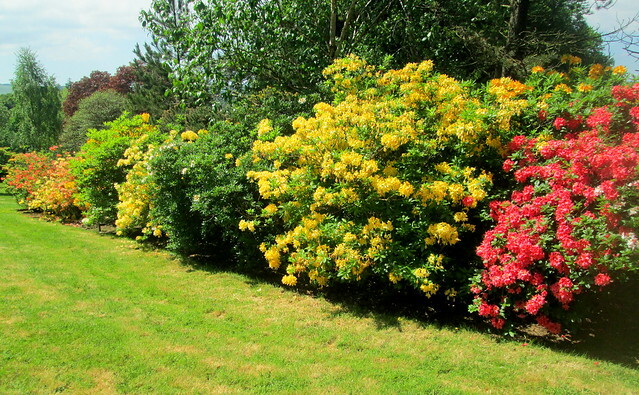 If you’re into gardening you should definitely visit Threave. They have a great plant nursery there with lots of plant varieties that feature in the gardens for sale, so of course I just had to purchase some. 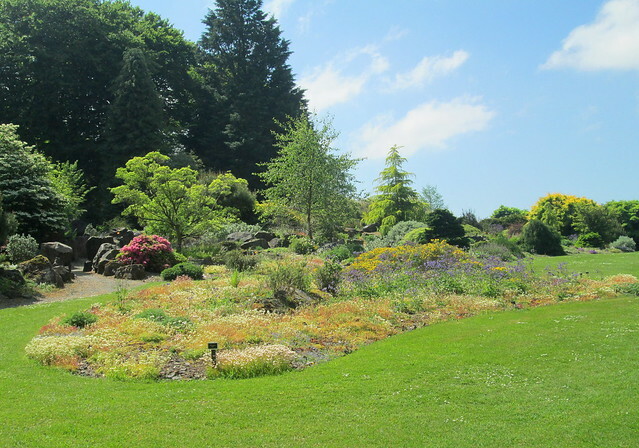 In my experience it’s rare to be able to buy plants that you’ve actually seen growing in gardens like this one and it drives me nuts that they don’t bother to make the most of the commercial possibilities. Whoever runs Threave has got it right! I took lots more photos but I’ll save the rest for another time. 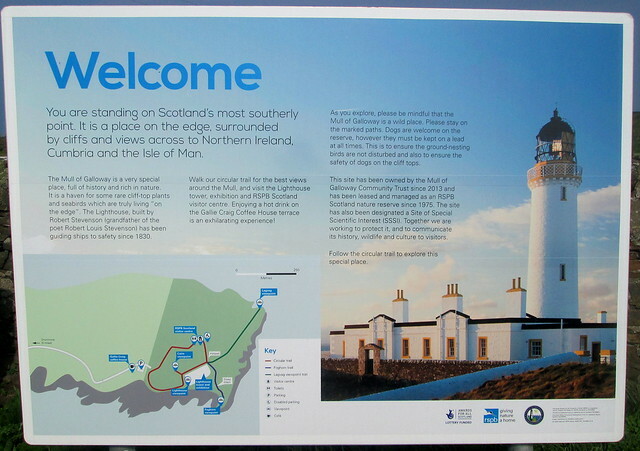 Last year we visted the furthest north point of Scotland so this year we couldn’t miss out on visiting the furthest southerly point of Scotland in Dumfries and Galloway. 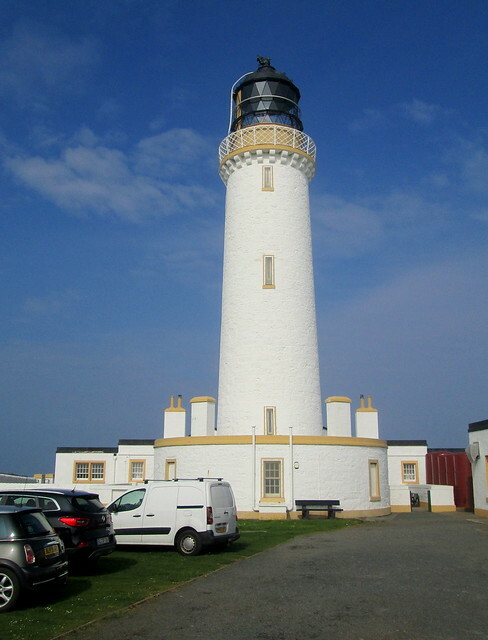 The Mull of Galloway lighthouse is one of the many designed and built by the Stevenson family which the writer Robert Louis Stevenson belonged to. 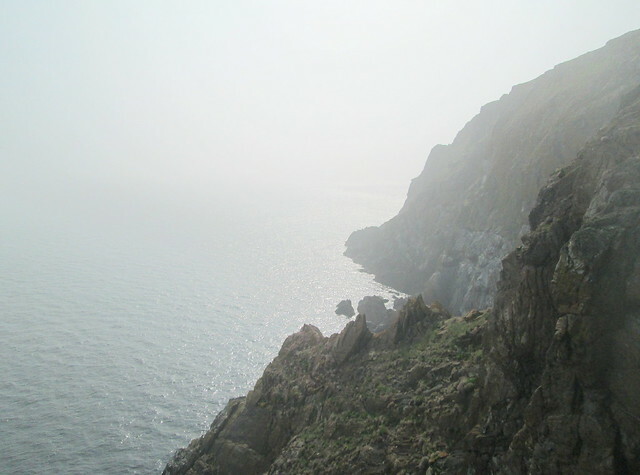 Jack was determined to stand on the very most southerly point which just happened to be where the foghorn is located. Thankfully it’s no longer in use. 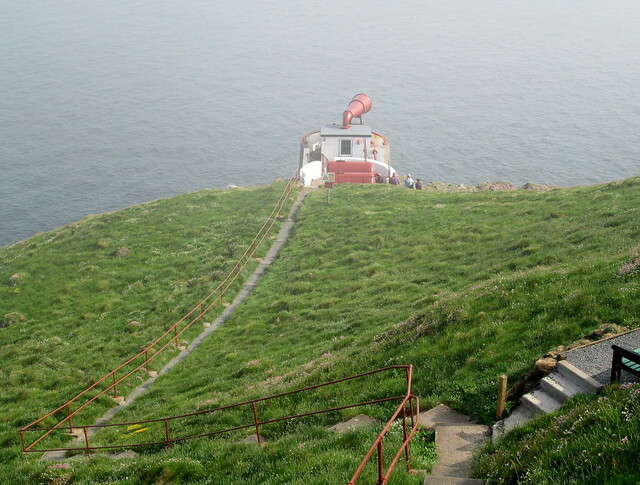 There are lots of steps down to it which was fine going down, not such fun on the way up though! 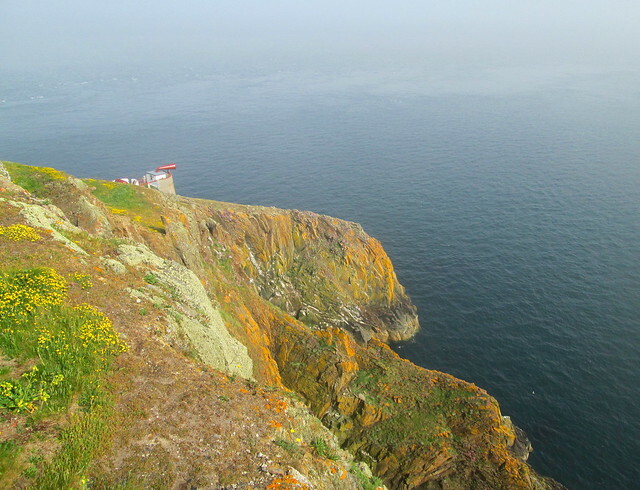 Below is a photo of the foghorn from the lighthouse, there was a real pall of sea mist (haar) so there was no chance of being able to see Ireland or the Isle of Man that day. The coastline is very rocky and dangerous as you can see and there seemed to be nobody around who was mad enough to hang off the rocks or cliffs as they did when we were up in Orkney last year. It looks like we had the place to ourselves but it was very busy, especially considering it was quite late on in the day. Anyway, that’s another thing ticked off our non-existent bucket list. 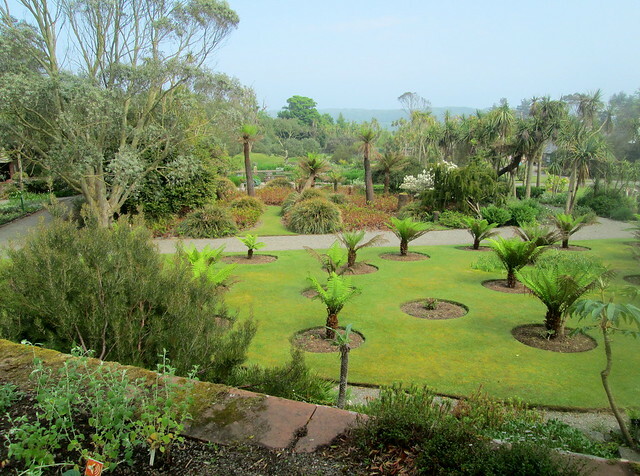 For years I’ve been reading about Logan Botanic Garden in Dumfries and Galloway, that part of Scotland has a milder climate than the rest of the country, being in the south west the weather is most influenced by the Gulf Stream so is usually frost free, hence tree ferns can safely be grown there as you can see. 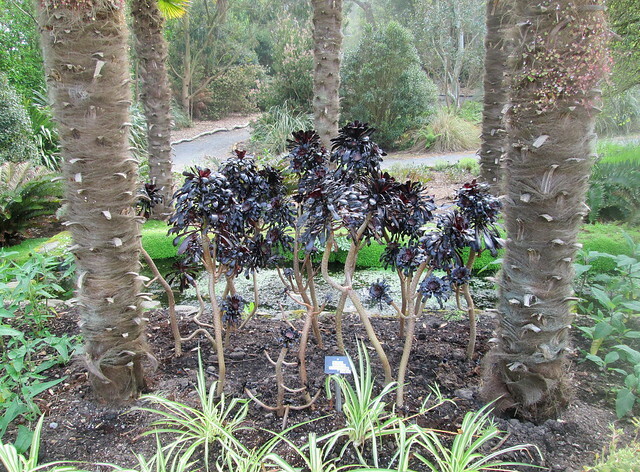 I must admit that they’re not my favourite sort of plants but there were plenty of others to admire. 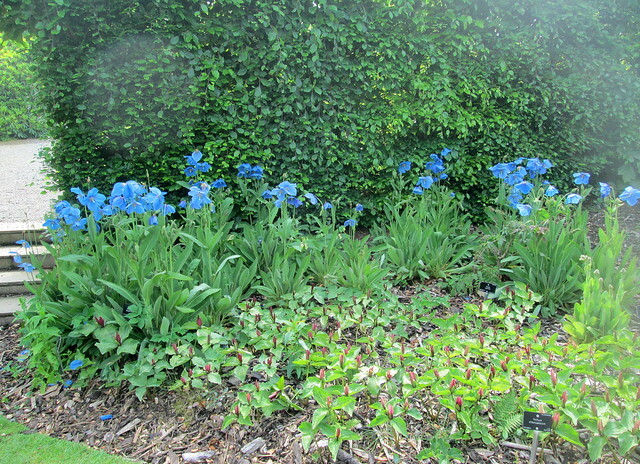 The Mecanopsis obviously enjoy the growing conditions there. This must be the most often manslaughtered plant in the UK. I’ve tried it several times in various gardens and I’m trying it yet again, so far so good although it hasn’t flowered yet. There was a shy and retiring big orange bird wandering about in the Australasian section, I hope there are more of its kind to keep it company. 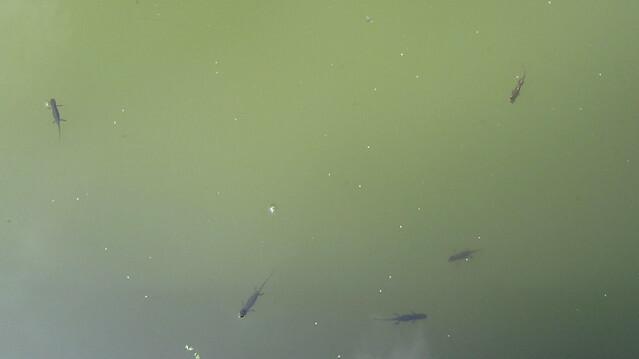 You might find it hard to believe but neither of us had seen newts before, this pond was full of them. 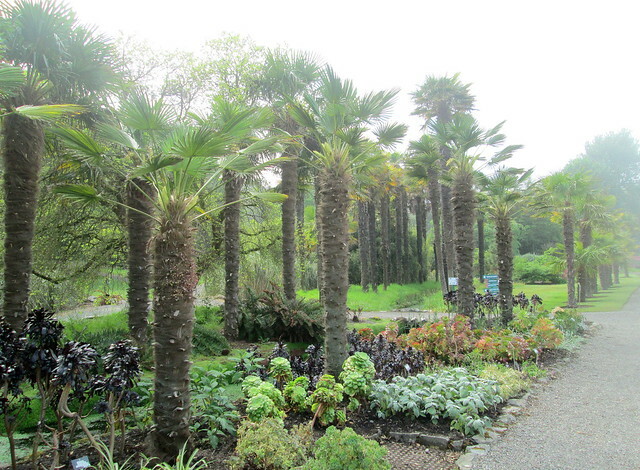 These ‘palm’ trees are often grown in coastal places around Scotland but they’re usually a lot more scruffy looking. 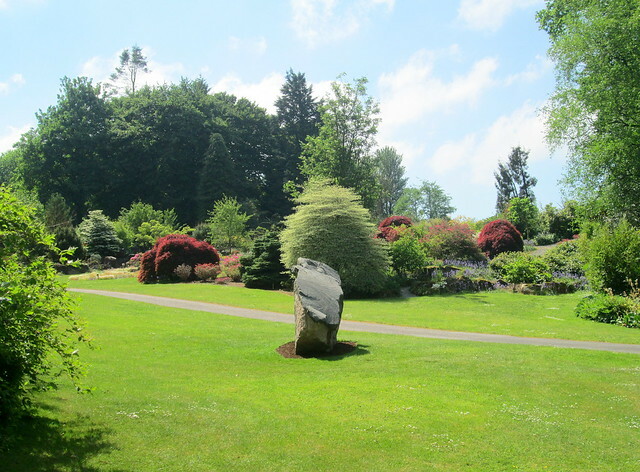 It seems that wherever you wander in Scotland there’s a castle or tower ruin nearby and the same goes for Logan Botanic Garden which has Balzieland Castle in the middle of it, it isn’t open to the public but if you’re interested in its history have a look here.. 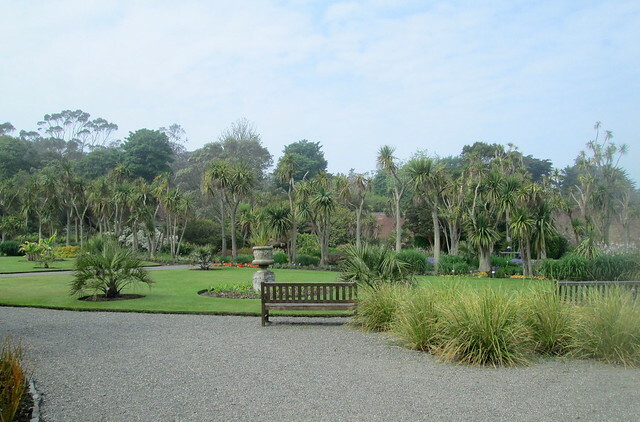 It was a gorgeous afternoon and I had a lovely time but I must admit that I much prefer native plants to exotic plants which are quite likely to need mollycoddling to get through the winter, although maybe that’s not really necessary at this location. 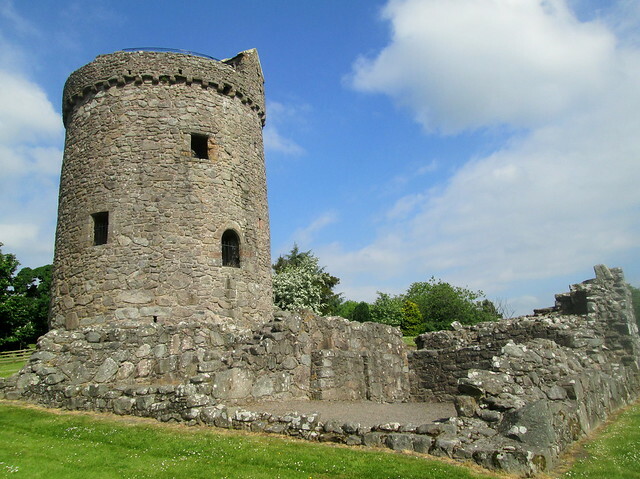 Orchardton Tower is apparently the only one of its kind in Scotland and it dates from the 1400s. 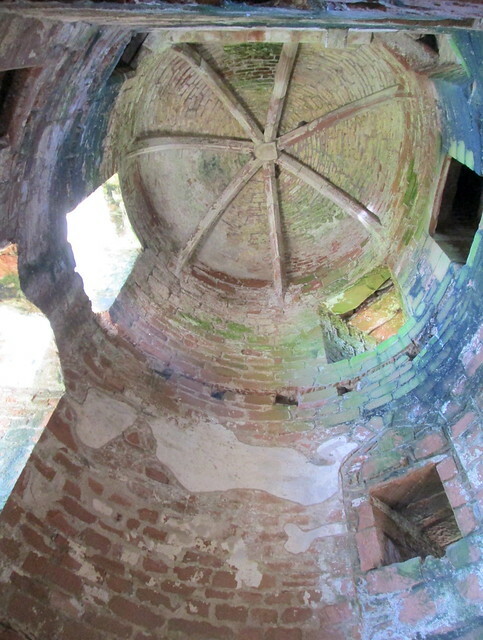 It’s unusual as it’s a free-standing round tower, built as a fortified home for John Cairns, a nobleman who had it built over 200 years after this design went out of fashion. I can’t say that I blame him for that as it’s a really elegant design and is in a beautiful location. I think in its heyday it must have been a lovely house to live in. 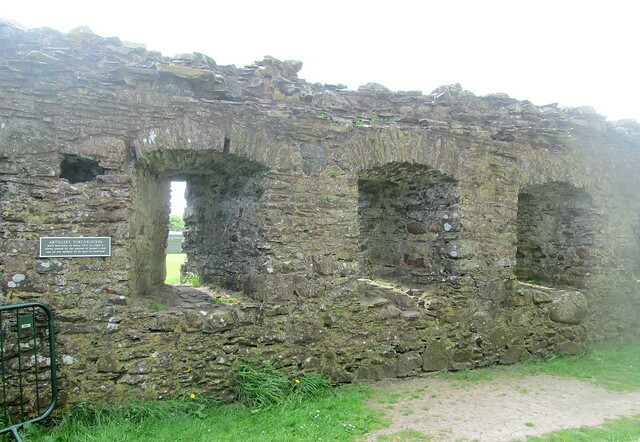 The kitchens and servants quarters must have been in the part which is detached and now just a ruin. 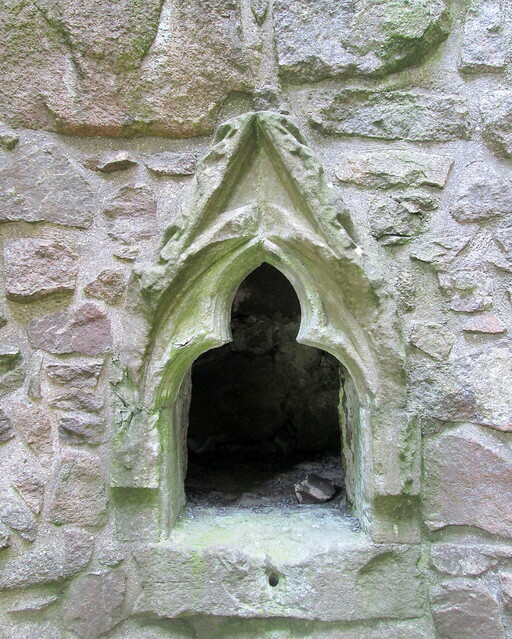 The photo below is of a piscina, a niche where bowls could be washed, they’re more often located in abbeys and cathedrals, to rinse the sacramental vessels. All of the interior floors are long gone. 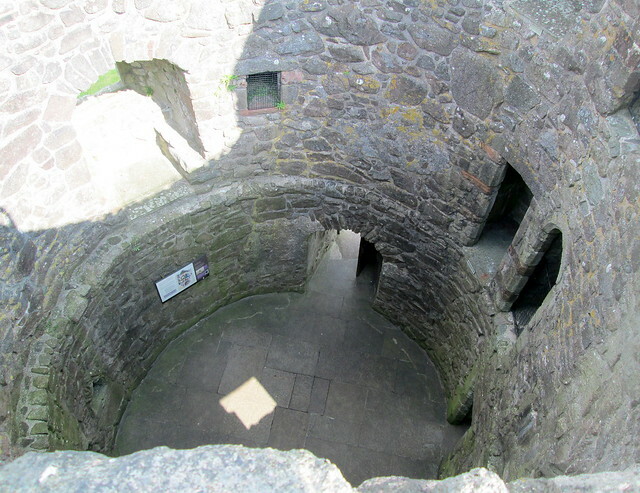 But there is a spiral staircase right to the top of the tower, it’s a long way down! As you can see in the photo below there’s a cute wee ‘house’ at the top of the staircase leading onto the roof. 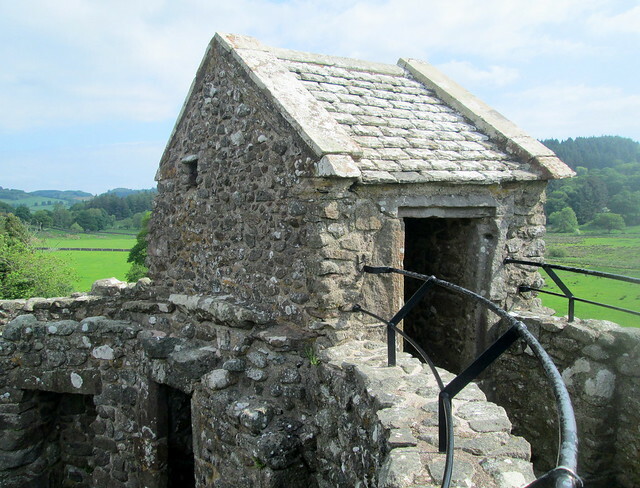 A view from the top of the tower. The very slim one track road with passing places that leads to the tower is quite nerve wracking on a bright early summer day, so I can’t imagine how awful it must be in the winter, but there is at least one house close by. I imagine that the view from their house compensates for any disadvantages of living there. I must admit that I love that tower and location. 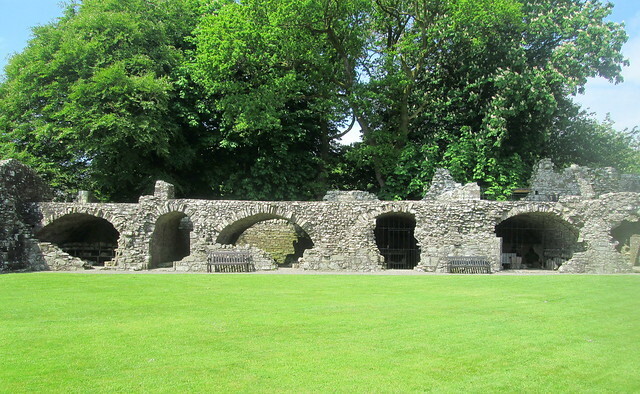 We visited Dundrennan Abbey last week. It’s a ruin now unsurprisingly as building here began in 1162, it was a Cistercian Abbey. 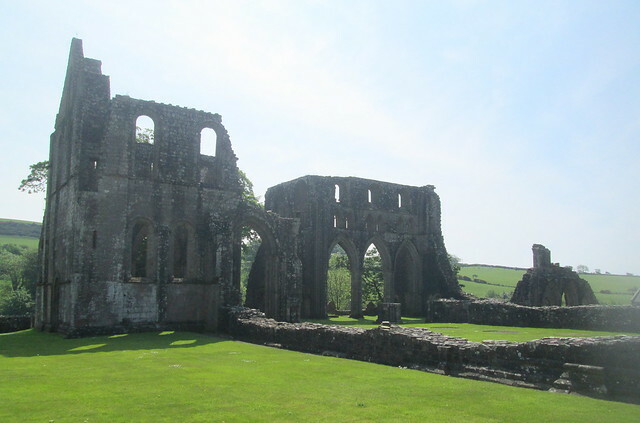 If you visit the abbey keep your fingers crossed that you get Glyn as your guide as his knowledge and enthusiasm for the subject are something to witness. 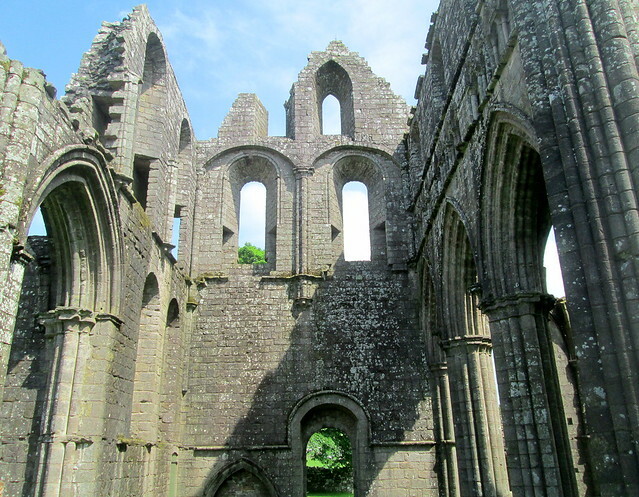 The abbey is of course a ruin now as it was abandoned as a church centuries ago. 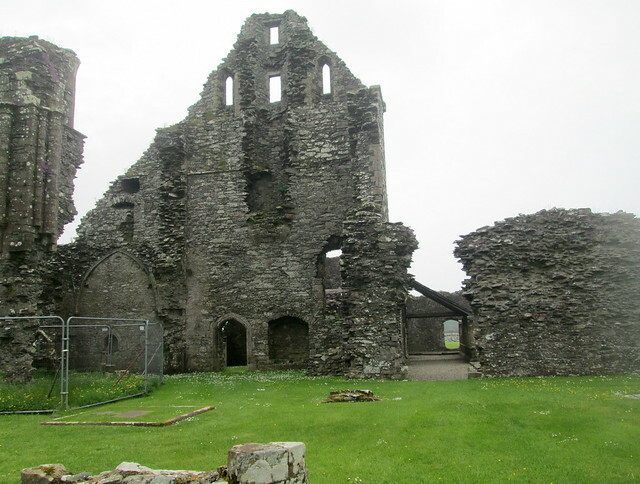 This is where Mary Queen of Scots spent her last hours on Scottish soil before she was taken to Workington, probably by the tide, where she was made prisoner by the English to begin what turned out to be 18 years of incarceration before her execution and martyrdom (if you are of the Roman Cathoic faith). She rode here from Langside in Glasgow where the last battle was fought and lost by her troops. Almost certainly she didn’t go straight to the Abbey as that would have been too obvious a destination for her pursuers. 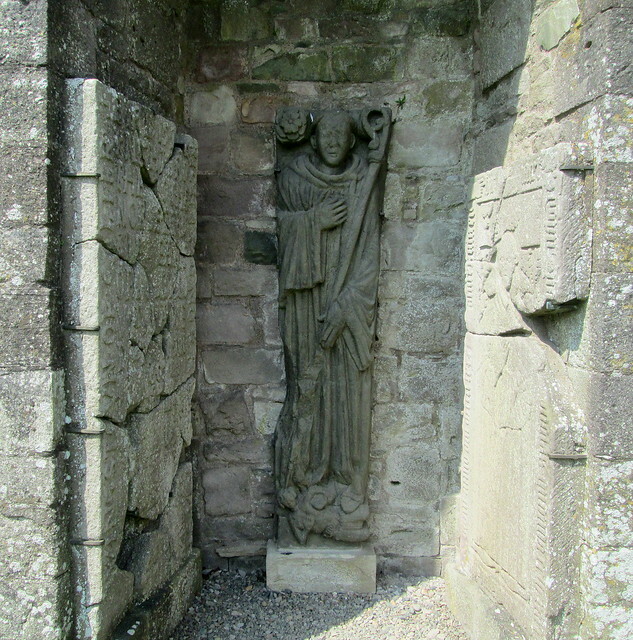 It’s thought that she went to a house in the forests nearby (according to local history) but after a few days she left that place and spent the night in the Abbey’s commendator’s house. Was she waiting for a ship to take her to France and safety? Ships sailed almost right up to the abbey from the Solway Firth in those days. She was probably trying to make up her mind where to go, she would have realised that her presence in France wouldn’t have been welcome. They wanted rid of her immediately after her husband the Dauphin died. Perhaps Spain would welcome her. We’ll never know as spies had tracked her movements and the rest is history. 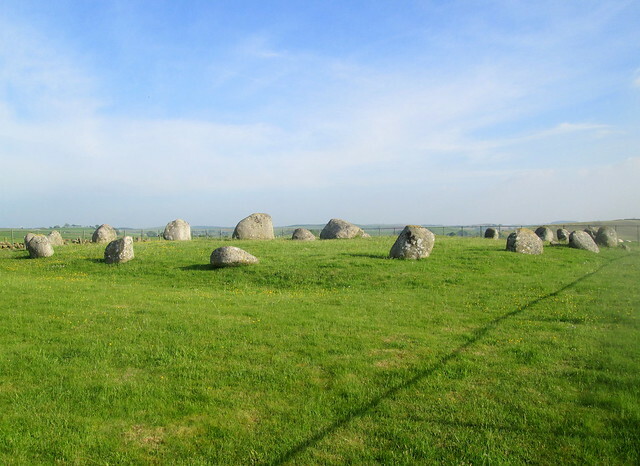 Below is a photo of storage areas, housing mainly bits of stone carving now but the site of the building where she stayed. 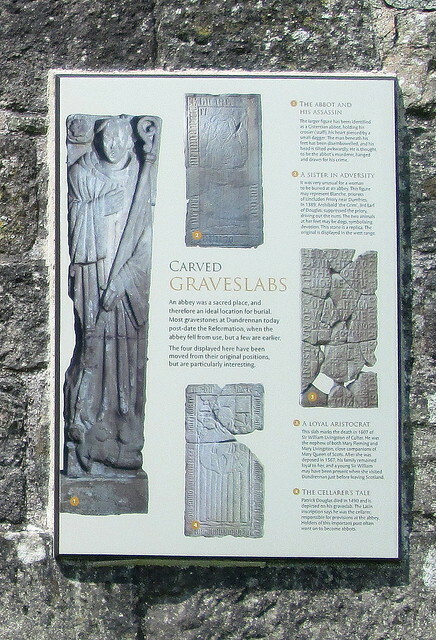 I was interested to read that one of the gravestones here refers to a knight called Livingstone of Culter. 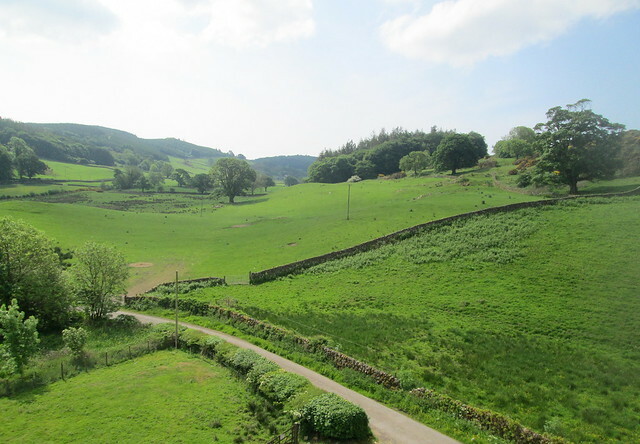 Dorothy Dunnett’s Lymond Chronicles are set around the Scottish Borderlands and of course she used the place name Culter although she didn’t base the Lymonds/Crawfords on any particular people apparently.